Has this been a good or a bad week — I can’t decide? I know I’ve been obsessed with film-making since my initial foray into the medium, transmuting collage number two into another film (https://vimeo.com/90254922). I’ve experimented with the final finish — frame length and whether to animate or not — settling finally (for now!) on a simple, paired-down approach that focuses attention on pure looking. Seduced by their ethos and great layout, Vimeo is where both films are now hosted. The second film was much harder to make than the first. I tried using far more images at a rapid frame rate but the result was too busy and not consistent quality-wise so I’ve stuck with the less-is-more approach. An attempt to shift To slice n.02 to a filmic state failed, possibly because it has insufficient texture and layering for the photographic interplay of focus and blurring to work. I must trust my instincts. As with any making process, when it works I seem to shift into an ‘other’ almost transcendental personal state. Forcing making under any other conditions is a warning to STOP! I film exciting. It’s a fresh way to offer a physical collaged object to a viewer, one insisting upon careful and specific engagement if the spectator agrees to look at all. It sends the work out into the ether with minimum intervention – quick, no need for complex installation – both practical and liberating. But I acknowledge I’m still too close to the initial making process to judge true critical merit. Is the work stronger or weaker than a physically collaged offering, or is it simply different? New opportunities — the ones that aren’t part of my usual way of working but I find myself instinctively drawn to — can be a fantastic way to develop ones practice. The collage abuse series came about in this way, and another opportunity this week resulted in me transmuting one collage into a series of filmic stills. This flirt with film is definitely a first for me. It’s an approach which fractures viewing into small slices that gradually reveal a whole, an exercise both in giving and in withholding. Sabine Kriebel voiced the opinion photographs are a witness to aging, capturing a moment that’s always past and anticipating the body’s passing. (1) The stillness of photography promotes the notion of death whereas film returns the dead to an appearance of life. (1) Given this, what does my approach deliver? Perhaps it creates a kind of half-life, incapable of animating the dead image in any way but able to animate and capture my viewing perspective as the artist and communicate it more readily and immediately to a willing spectator? For me, the approach is yet another form of collage; something born out of disparate fragments recombined to make something new. However, to some extent, it’s a much more controlling mechanism that the original collage. I can’t control how someone looks at a picture on a wall, but a filmic approach fixes frame, order, and duration. Yes, the viewer may choose not to look at all, but if they do, they are subject to what I dictate. I worked with a single collage, To accrete no5, and found spending time shooting it resulted in it giving up its most interesting angles, textures, tones, colour, and compositions. The experience felt like composing and painting through the mechanism of the camera. I’m aware that the approach extends the shift of the raw materials across mediums — original photograph — to scanned digital information — to collaged physical object — back to photograph — finally ending in filmic stills. Obviously, there is no reason for the dislocation to stop here — it could continue endlessly. My intention was to work with some logic — a flow of composition around the picture plane — but to pan in and out on different shots emphasising details and dislocating the viewing perspective from one still to another. I discovered lighting this multi-layered collage from above and to one side delivered far more dramatic results than the more traditional, even, illumination from both sides. 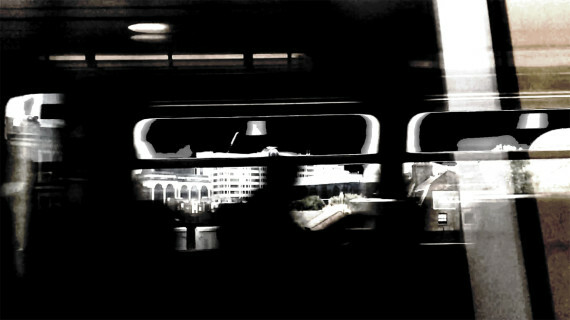 The shots have been deliberately tweaked in Photoshop to emphasise drama and bring out extremes of contrast and focus. This is my first foray into Windows Movie Maker. I found it pretty user friendly with nifty functions to animate the slide like crossfade and zoom. These allowed me to increase disjuncture, resulting in something with a constant gentle drift to the viewer’s left. My goal is to create a fractured viewing experience that encourages careful looking and is more thought-provoking than simply encountering the still shot that reveals everything at one glance. I’d like it to begin by hinting at what’s on offer, revealing ‘truth’ only towards the end of the experience. 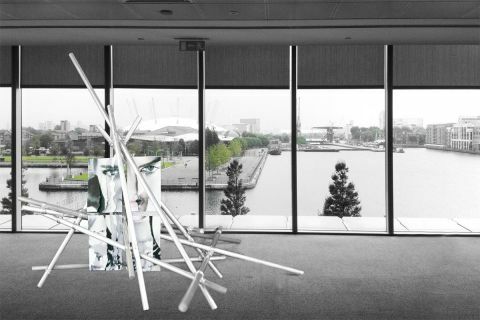 Here’s my third and final version of Not at Clifford Chance. For the first time I’ve used one set of images but then split them four-ways to increase complexity and disjuncture without making them so busy they undermine the sculpture itself. Rather than applying different collage techniques to each panel it proved better to restrict myself to two approaches — to accrete and to slice in this case. I rotated the sculpture and re-positioned (embedded) the collages within it to ensure plenty of interruption to the picture plane by the rods. Last time, I questioned what was added marrying collages with sculpture — would they be just as effective mounted direct onto the wall? For me, the answer is the rods definitely add disruption. I don’t think Not at Clifford Chance interrupts the picture plane any more effectively than the more uniform approach of In the shadow of her gaze no.2, but overall the piece is more aggressive and assertive thanks to the increased scale of the collages, the more abrupt physicality of the scaffold poles, and the greater architectural form of the construction itself. All-in-all, I think this is the most successful version of Not at Clifford Chance. Mirrors top and bottom in the horizontal plane create an endless chasm in which to fall or float upwards. A similar effective effect results if two mirrors are placed opposite each other in a vertical plane but the impact is less successful. It simply results in replication, not a pit to topple into. Abutting a mirror to the sculpture so edges touch creates a seamless repetition – a duplicate sculpture. Large vertical mirrors pull the viewer in too abruptly and definitively, whereas smaller slivers of refraction are more subtle. One minute part of you is pulled in and the next it’s gone as your position shifts.